A good chicken salad sandwich on a croissant is heavenly but typically not one of the healthiest lunches on the menu. I remember ordering it for lunch and thinking it was a healthy choice until I started looking closely at the ingredients. While the basic nutrition they show may look harmless, when you start looking at the actual ingredients, sugar shows up everywhere! The croissant, the chicken salad, and the base within the chicken salad. While its not a bad thing to indulge, satisfy the craving more often by making this healthier version. This creamy but hearty salad makes an amazing lunch or easy dinner using leftover chicken (or turkey). If the craving hits but you don’t have any leftover chicken, boil a chicken breast or two depending on size until cooked, cool, and shred. This salad can be put on bread or over a bed of arugula and be just as good. Half the time I pile my sandwich so full I end up eating it with a fork anyway. 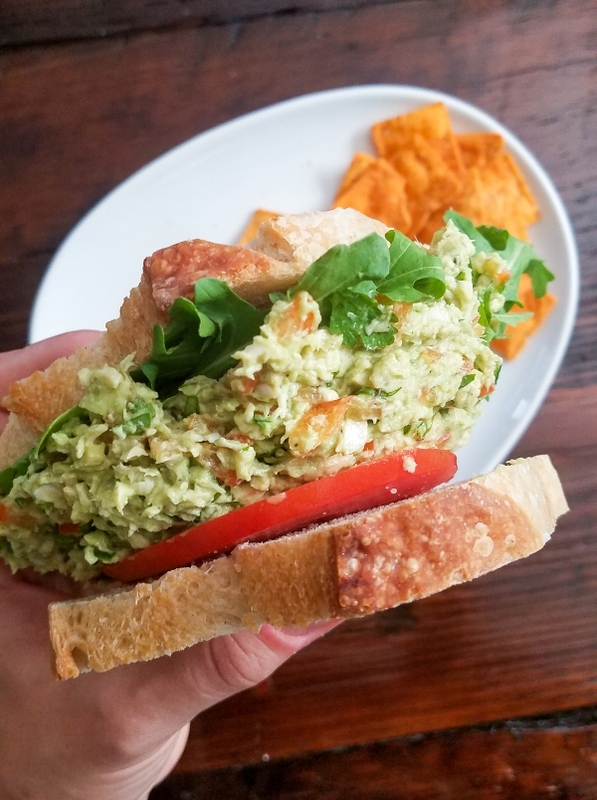 Check out my basic bread recipe for a sugar-less option to hold the chicken salad. If you are making this ahead of time, now is a good time to stop. Complete the next steps when you are ready to assemble the sandwich. Cut avocado in half, remove seed, and mash with a fork within each shell half.